All the other buttons lead to useful information - so get back to the index page and start reading!!!! Examples with all the different objects. 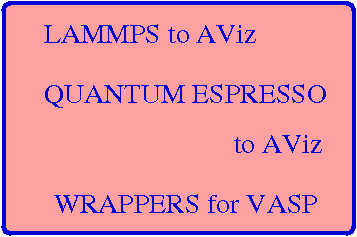 Scripts to feed output from other codes into AViz. Slides from an AViz tutorial. We hope other groups will send links to their images with AViz. Older installation advice and help for your systems people. Technion Computational Physics Group publications including AViz movies. Home page of the AViz LISTSERV for sending AViz news. Selected AViz applications with good instructional sites - from Technion student projects. All the Technion student projects, including many AViz applications. A set of older AViz examples, including links to the data files. 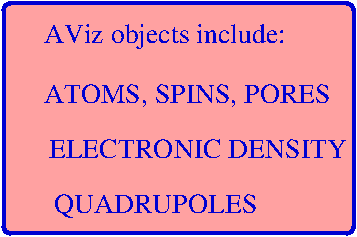 Three projects, one a code to build AViz nanotubes, one with WebGL for percolation and an msql database of lattice images.